How does the human brain decide what information to attend to and what information to ignore? Relevance detection refers to neural processes determining the salience of a stimulus. Although social information is known to be of high intrinsic relevance to the human organism, and previous fMRI investigations have shown that it likely is processed as a unique stimulus dimension, it remains largely unknown how relevance detection in terms of novelty, pleasantness, and goal/need relevance may interact with the processing of social relevance. One region of interest for fMRI analyses is the amygdala (see references by Sander, Ousdal, as well as Pessoa and Adolphs), but other brain areas are considered as well. I am also interested in individual differences that may influence relevance detection. In one study published in Frontiers in Human Neuroscience (2013), we investigated the neural substrates of social versus emotional relevance. In order to do so, we presented images depicting complex visual scenes to healthy adult participants that could either have a social or nonsocial content, and be of either positive, negative or “neutral” valence. We found that in several brain areas, comprising the bilateral amygdala, fusiform gyrus, anterior superior temporal gyrus and medial orbitofrontal cortex, brain activity reflected interactive processing of social content and emotional valence. Firstly, activity was always higher to emotional versus neutral images. Second, activity was always higher to social versus nonsocial images. And third, activity to social images did not significantly differ as a function of positive versus negative valence, whereas for nonsocial images, activity was higher for negative versus positive images (see Figure above illustrating such pattern in bilateral amygdala). Our findings suggest that the human brain, or at least the regions mentioned above, attribute(s) stronger relevance to social (versus nonsocial) information, regardless of valence. This reflects the notion that social information is highly salient for human behavior per se. In turn, probably because of the higher biological salience in terms of survival, nonsocial negative (versus positive) information is preferentially processed, allowing for a fast detection of potential threats. 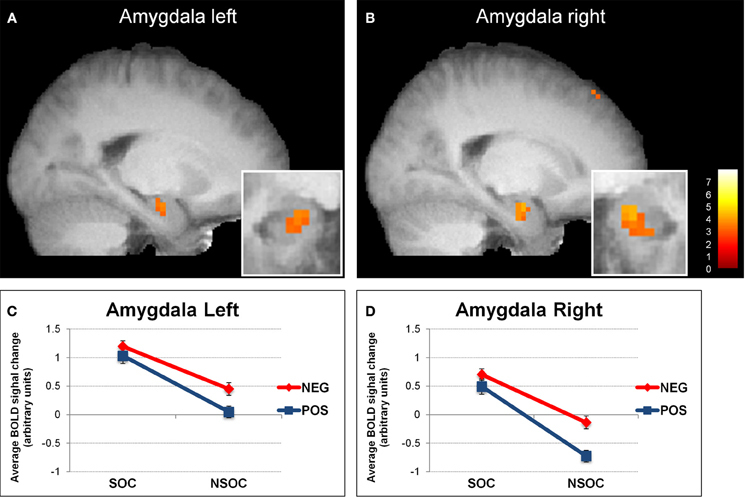 Interestingly, the above social by emotional relevance interaction in the right amygdala was modulated by the participants’ trait anxiety: the higher the participants’ trait anxiety, the weaker the interaction became (i.e. for high trait anxious participants, there was only a main effect of social and emotional relevance, but no longer an interaction). This effect was driven by a selective decrease of activity for the social positive condition with increasing trait anxiety scores. A putative explanation could be stronger habituation due to subjectively perceived lower relevance of social positive information for high trait anxious people. See also my recent blog post on this issue. To build upon the above published fMRI data, Annekathrin Schacht (University of Göttingen, Germany) and I took the same complex visual scenes as used in the fMRI study and embedded them into an EEG task to investigate the more precise temporal unfolding of social and emotional relevance processing. Our main questions were (i) which of these two stimulus dimensions was processed first – i.e. which relevance check occurred first -, and (ii) when in time social and emotional relevance processing would interact as suggested by our fMRI data – as opposed to be processed separately and/or additively. Interestingly, we found that social and emotional relevance was processed interactively already at very early stages of visual processing, namely at around 80-120 ms after stimulus onset during the P1 – especially for social positive versus nonsocial positive content. Such interactive processing continued around 200-320 ms during the EPN with a slightly different pattern. Furthermore, the interaction pattern observed with EEG strongly resembled the interaction pattern detected with fMRI (especially the pattern between 200-320 ms during the EPN), and source localization of the ERP components of the social > nonsocial effect revealed strongly overlapping neural substrates. The corresponding paper is now published in CABN (open access). As a logical next step – having looked at social and emotional relevance processing in fMRI and EEG separately – Annekathrin Schacht & Simon Weber (University of Göttingen, Germany) and I ran a follow up study during which EEG and fMRI data using the same stimuli was acquired from the same participants. In so doing, we will be able to combine the fMRI and EEG data to obtain an even more elaborate spatiotemporal pattern of social and emotional relevance processing. The data is currently being analyzed. As part of a collaboration with the University of Geneva, we again used the same social versus nonsocial positive versus negative images to look at the neural substrates of social versus emotional relevance detection in 22q11DS patients versus healthy controls. The 22q11.2 deletion syndrome is a neurogenetic disorder associated with elevated risk for schizophrenia and high rates of distinct positive and negative symptoms. Social impairments were also described in this population. However, the neural correlates underlying these impairments are largely unknown. The observed results indicate atypical neural activation during social perception (social versus nonsocial images) in 22q11DS patients that appear to be independent of valence processing (no differences between groups). The corresponding paper is published open access online and can be downloaded here. In another fMRI study published in Emotion (2013), we examined brain responses to dynamic emotional facial expressions and comparable nonsocial stimuli (“lottery game”) as a function of stimulus novelty and valence. Novelty was conveyed by the presence versus absence of surprise, while valence was reflected by positive versus negative versus neutral stimulus content. We were especially interested in how the amygdala processes such different kinds of stimulus relevance. Our findings revealed an intriguing activation pattern, for both social and nonsocial stimulus processing. The amygdala did not seem to differentiate between valence and novelty as such, but was more strongly activated to dynamic information containing positive versus negative surprise. According to the available literature, and particularly a previous study by Yacubian et al. (2006), such findings suggest that the human amygdala – at least under conditions of uncertainty involving surprise conveyed by dynamic facial expressions – (i) encodes a negative expected value (anticipation of a negative outcome), and subsequently (ii) updates such expectation by means of a negative expected value prediction error if a positive outcome occurs instead. Our data propose that relevance processing in the human amygdala may not only be modulated by the static versus dynamic nature of stimulus presentation, but also depend on the degree of uncertainty / predictability of information. For more detailed information regarding my research on relevance detection, please refer to the Publications page or contact me with any questions.